My name is Dayna and I have been a part of the AEAH family since March of 2009. I am a San Diego native; although I moved around a bit, I landed back here in the sunny city. I am currently attending Grossmont College working towards a BA in Biology/Ecology with dreams of working towards elephant conservation. 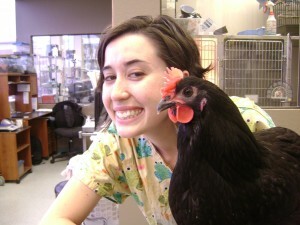 My previous hospital experience was with dogs and cats, but my interest has always been with exotics. I started out as a receptionist and have been trained in the various technical aspects of working hands-on with the animals. I have been extremely fortunate to learn from all the different people who I work with, learning something unique and specialized from each person. My favorite part of my job is the excitement of everyday being different, as well as the fast and upbeat pace that is the everyday norm at AEAH. I also love working as a technician on Sunday’s, as I am able to provide extra love and playtime for all the animals; both boarding and hospitalized. My personal pets consist of my 3 cats (Nollie, Danzig and Big P), a Greek Tortoise (Squints), an Ornate Box Turtle (Oscar Mike), a Three-Toed Box Turtle (Nancy), a Bearded Dragon (Ivy) and a Blue Nose Pit Bull (Briza).